Celebrating Over 40 Years of Whitewater Rafting Adventures! 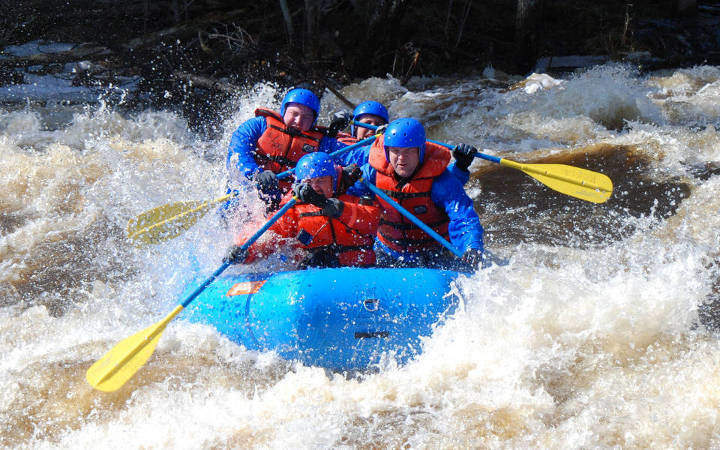 Kosir’s Rapid Rafts was Wisconsin’s first professional whitewater rafting outfitter with operations on both the “Roaring Rapids” section of the Peshtigo River and the mighty “Piers Gorge” section of the Menominee River. 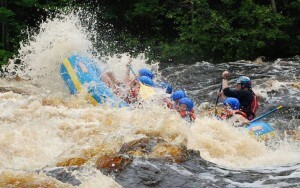 These are the most exciting and challenging whitewater rafting trips in Northern Wisconsin. We are the only Midwest Peshtigo River outfitter based on the river’s edge at the end of the famous “Roaring Rapids” section of the Peshtigo River. Our convenient and private landing is located at our company headquarters and campground We have a prime location on the shore of the Peshtigo River at the end of the “Roaring Rapids” section of the Peshtigo River. This section is one of the longest stretches of continuous whitewater in Wisconsin and the Midwest. 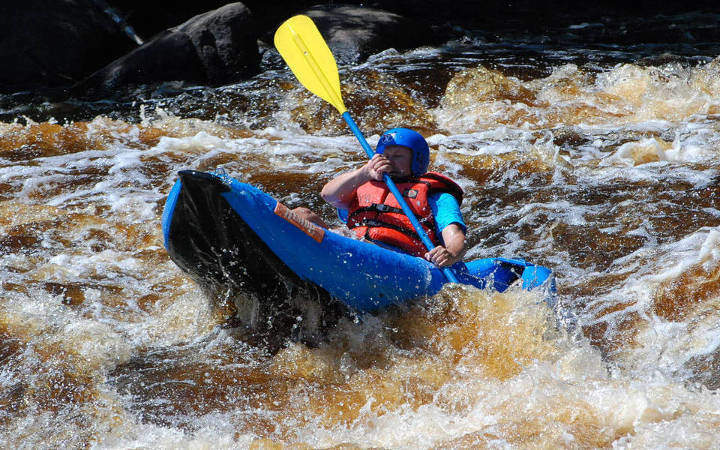 Peshtigo Spring Run-Off Trips Class III – IV whitewater rafting trips run from early April to mid-May, when the water is chilly but very fast and exciting. Spring whitewater rafting trips include Farmer John style wetsuits and booties along with helmets, life jackets and paddles, and are run in four, six and eight place rafts. On spring trips it is very important to advise everyone in your group to bring an unlined windbreaker, wool or synthetic pullover sweater and wool socks. Also, a polypropylene long underwear top is an excellent addition to your cold weather gear. Check in time is one hour before scheduled whitewater rafting trip time. Spring trips are very popular because the die-hard rafters like to go when the water is the highest. Snow melt coupled with spring thaws usually makes April and May the best for big water whitewater rafting in Wisconsin. It may be chilly, but you will keep warm with the provided wetsuit and the excitement. Peshtigo Summer Trips Class III Starting mid-May and running through September, for beginners and intermediates, whitewater rafting trips are run in one, two, three and four place rafts. Water conditions change daily and the actual size of the boat will be determined on the day of the your whitewater rafting trip. 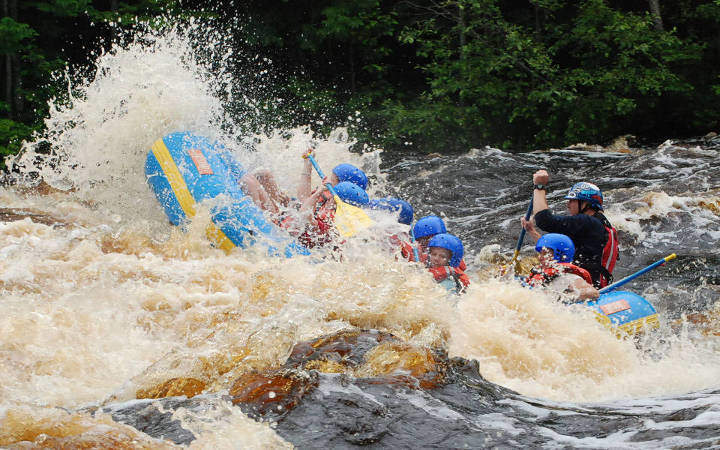 The trip covers about five miles of the most exciting white water in the entire Midwest. 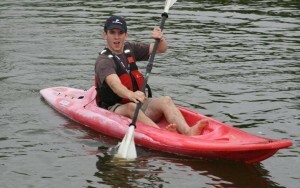 We provide helmets, life jackets, paddles, and transportation to the put-in point on the river. We are located right on the river, so all trips end at Rapid Rafts headquarters, where rafters can change clothes and relax. Check in time is 30 minutes before scheduled whitewater rafting trip time. Ask about our special group discounts offered for qualified scout, youth and church groups. Summer trips are for the entire family. This whitewater rafting trip is the same stretch of river that our spring trip covers but the weather is much warmer and so is the water. The river level may be lower but the thrill is always there. Funyaks are the most popular way to experience whitewater rafting on the Peshtigo River. A Funyak is a one-person inflatable raft. You paddle the Funyak with a two bladed kayak paddle and they are self-bailing so you’ll never need to empty out the water. Funyaks are perfect for any skill level including beginners. In fact they are easier to learn how to paddle than a raft. These are a thrill in higher water and great for lower water levels, with greater maneuverability. Because you are alone in the raft you have more control, you don’t have to try to coordinate your paddling skills with others in the raft. Being alone also means there is less weight in the raft, which makes it easier to move around or off obstacles if you should encounter some. Just keep in mind that even though you are alone in the raft you are never alone on the river, we always have staff on hand with every whitewater rafting trip happy to assist you. For more enjoyment in low water or a bigger thrill in high water try a “Funyak” the next time you raft with Kosir’s Rapid Rafts. For those warm weather, low water Peshtigo days, Kosir’s Rapid Rafts offers tubing on the Peshtigo River below the whitewater stretch. The trip starts at our normal takeout at the Bridge and goes for about 45 minutes down the river to the first boat landing. 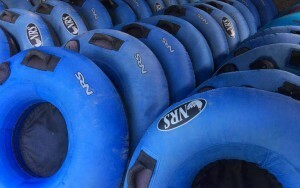 Kosir’s Rapid Rafts now have sit-on-top, flat water kayaks available for rent. We start at boat landing where the tubing trips take out and paddle two miles down the Peshtigo River and onto Caldron Falls Flowage to the next boat landing and back. 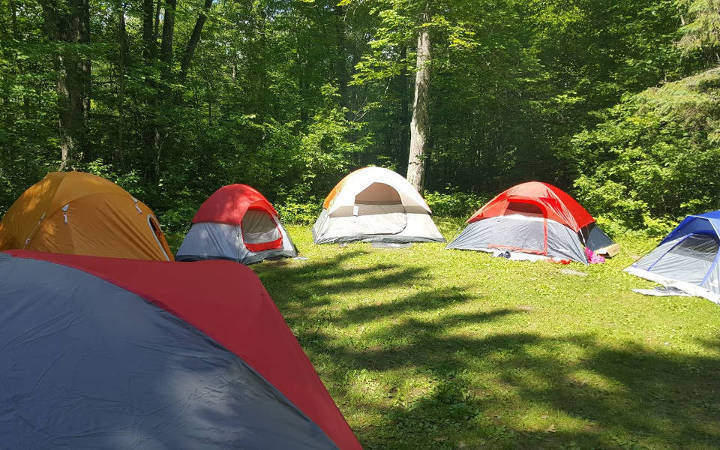 Our campground offers a range of campsites including sites with water and electric hook-up for RVs and trails and large sites for groups such as scouts or family reunions. All sites are wooded, roomy, and include a picnic table and fire pit. Our clean, modern shower house offers hot showers and flush toilets. In addition, running water and pit toilets are conveniently located throughout the campground. Located only steps away from our Peshtigo River take-out and less than an hour from the Michigan border (which is the Menominee River) we have a large, wooded campground, complete with a clean, modern shower house. These campsites are roomy and come with picnic tables and fire pits. We have Larger Group Sites available as well as sites with water and electric hook-ups for RV’s and trailers. Beautiful Relaxing Environment, these areas of Northeast Wisconsin are a must see! The beautiful scenery, woods and waters will give you a feel of freedom and serenity. Use Kosir’s Rapid Rafts as a starting point for outdoor adventure. We are close to the Nicolet National Forest, the Peshtigo River State Forest and the Caldron Falls and High Falls Flowages. Many recreational opportunities are available in the surrounding area. Great Time & Great Staff! THANK YOU for jumping in after me! Living in Chicago I thought I saw it all. This was an awesome Experience. I’ll be back! Awsome! For more than 15 years Kosir’s has provided us with the greatest time. Looking forward to the next fifteen years. Memories of a lifetime are made at Kosir’s every year. Looking forward to our next visit. When in Northeastern Wisconsin, Kosir’s is a must. 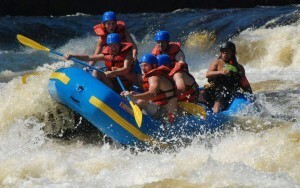 Great camping & whitewater rafting. Cya next year! Our twitter page and Instagram are up and running! Be sure to give us a follow to stay up to date with exclusive deals/giveaways on each page!